British newspapers in the past few days (e.g. The Telegraph) have reported that the decision of the Supreme Court of the United Kingdom on the Article 50 'Brexit' Appeal is scheduled to be issued to the public at 9:30 a.m. on Tuesday. Expert expectations regarding the Supreme Court decision are that a Parliament vote on Brexit will be required to trigger an Article 50 exit, i.e. it is expected that the Justices will rule that Prime Minister Theresa May's government does not have the prerogative power to trigger Article 50 and that this can only be done by an Act of Parliament. We posted previously that Brexit is Likely Not a Legal EU Exit Without UK Parliament Approval as Required by British Constitutional Law Principles. Achieving that objective after the court's pending decision may be easier said than done. The Court might even create more requirements. Quick approval for Brexit from the House of Commons is considered likely, but gaining such approval from the House of Lords will be more difficult. British Prime Minister Theresa May already backed down last year from alienating the House of Lords. Rob Merrick at The Independent wrote an article last year headlined: Theresa May backs out of fight to curb House of Lords power over Article 50 delay fears: A move to strip peers of their right to veto 'statutory instruments' has been abandoned, sources say - in an attempt to calm their anger over Brexit. We do not expect the House of Lords to "rubber stamp" Brexit. They are the powerful "unknowns" in the entire Brexit equation. Many people have assumed that the UK exit from the EU was settled by the Brexit referendum, but they have greatly underestimated the massive long-term legal, economic and political infrastructure that any political and economic alliance involves, especially something as massive as the European Union. One need remember that the Brexit referendum has no direct force of law and is considered politically "advisory" only. Of course, its populist "yes" result has strong political force as regards the prevailing government in power, but that is not the same as the rule of law. Indeed, political referendums have been ignored by governments before. Indeed, even if Brexit actually occurs down the road, the long-term negative repercussions on the United Kingdom will be severe for many years. That is why democracies have "representative" governments -- to assure the continuity of policies and the orderly handling of things, according to the law. Many people in the United Kingdom have already incurred large, unexpected financial losses as a consequence of the negative expectations raised by the prospect of Brexit. We recently talked to someone who attends a (previously) very popular "European" trade fair in the UK every year. This time around that same trade fair was "virtually empty". Similarly, tourism to the UK has in the past been composed to 67% of visitors from the European Union, who spend billions in the UK. Many tourist-dependent enterprises worry that the future will bring fewer EU visitors. The inevitable solution in such a case of course will be to recruit tourists from far-off lands, meaning that the goal of having fewer foreigners or less foreign influence in the UK, a main objective of Brexit, may not be achieved at all. It is also no coincidence that British Prime Minister May will be the first foreign dignitary to visit newly inaugurated U.S. President Donald Trump in Washington D.C. and that trade is scheduled to be a big topic. Brexit will put the UK into a more isolated position economically, so that they will have to find new markets. It all reminds a bit of the problems faced by the former Queen Elizabeth I, daughter of Henry VIII and his second wife, Anne Boleyn. Elizabeth was excommunicated by Pope Pius V, barring England economically from then predominantly Roman Catholic Europe. Elizabeth had to turn to establishing economic relations with non-Christian empires in the Near East to supplant the lost European trade, which brought much foreign influence into Britain. If the majority of people in the United Kingdom continue to support disengagement from the European Union, obviously, democratic principles require that Brexit ultimately be implemented, but it is a complicated business that can not be executed until the future-necessitated legal details have been correctly legislated and the existing legal obligations fulfilled. It will in any case be interesting to see how the drama unfolds. The "Sky Map" viz. 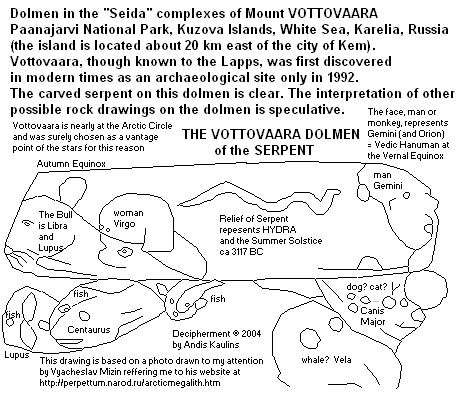 "Star Map" Dolmen in the "Seida" Complexes of Mount Vottovaara, Paanajarvi National Park, Kuzova Islands, White Sea, Karelia, Russia has figures that show definite similarities to the lower half of Avebury Stone #10, e.g. serpent, whale. 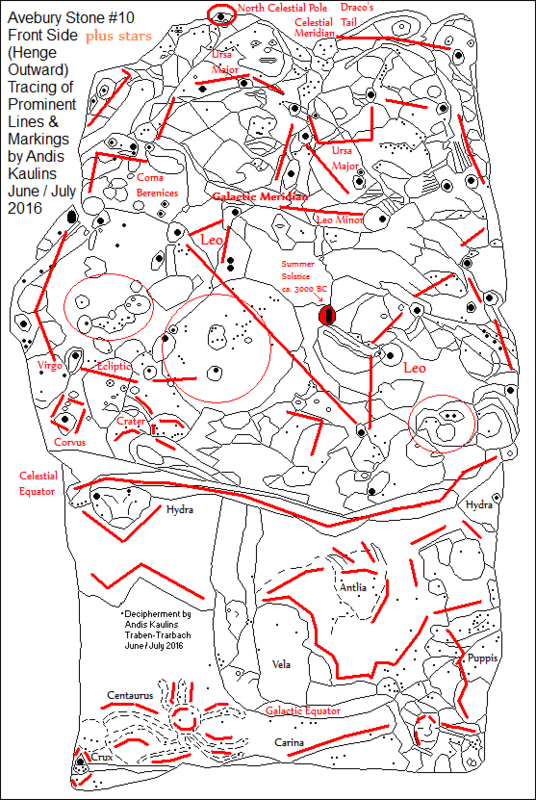 The Sky Map of Staraya Zalavruga, Karelia, Russia was one of our very early astronomical decipherments. We were then examining the origins of Pharaonic civilization in the ancient rock art of pre-historic Norse seafarers. We made the possible connection because the Egyptian wadis have "seafaring" rock art similar to ancient "seafaring" Norse rock art. We think the Planisphere of Staraya Zalavruga in Karelia, Russia, could be even older than the Hermitage Planisphere. We deciphered this star map also in the year 2002 as marking stars oriented to the Milky Way and preceding some similar features later found in Pharaonic civilization. Provisionally, we date it to ca. 4000 B.C. 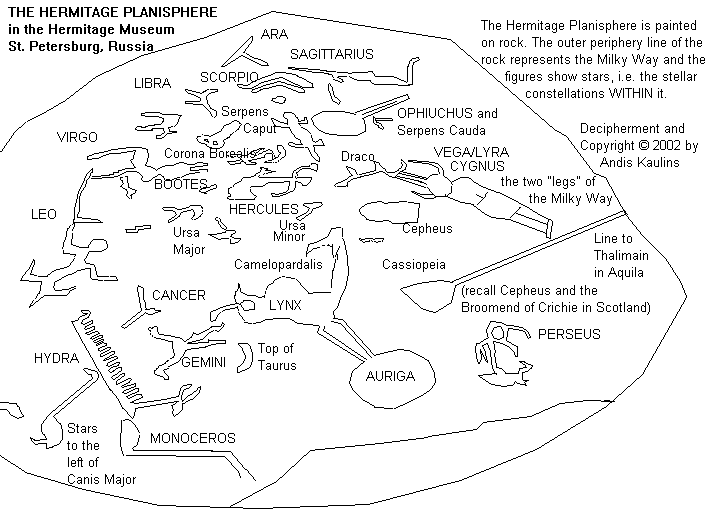 "The Hermitage Planisphere is painted on rock. The outer periphery line of the rock represents the Milky Way and the figures show stars, i.e. the stellar constellations WITHIN it." 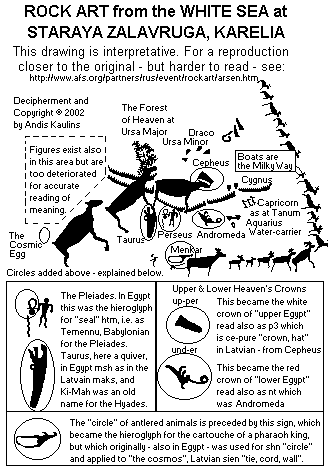 This was an early decipherment showing that the Milky Way was a major point of focus for ancient skywatchers. The spatula-like figure to the right, based on similar such spatulas carved on megaliths at other megalithic sites, points to an Equinox or Solstice point in the stars. 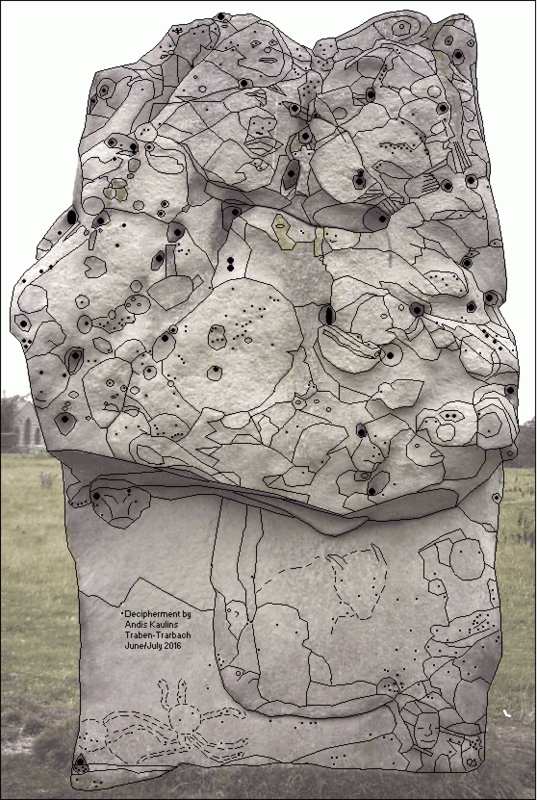 We are putting finishing touches on our book about the Avebury Henge Stones and present here an excerpt from the section titled: Avebury Henge Stone #10 As the First Deciphered Megalith, which contains new materials regarding the cosmological viz. religious significance of Avebury in its era. Avebury Stone #10 was the first Avebury Henge megalith that we deciphered, and we knew then that we were on to something extraordinary in terms of human history. 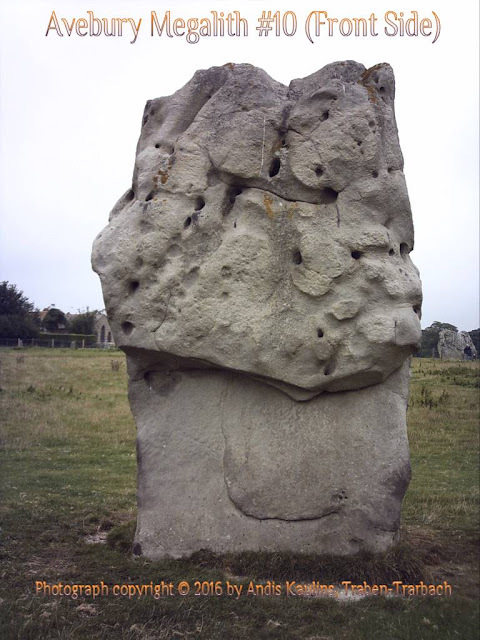 We initially pre-announced the forthcoming book at the Ancient World Blog at http://ancientworldblog.blogspot.com/2016/08/introducing-avebury-stones-of-avebury.html. We now present some new aspects here. Our decipherment of Avebury Henge Stone #10 provides us with key insights into the astronomically-oriented "pre-Christian" cosmological viz. religious belief system of the peoples of Ancient Britain, viz. the peoples in Ancient Britain who created the Avebury Henge Stones & Circles and the related megalithic sites, including Stonehenge, the latter site which also shows later vestiges of the same original belief system found at Avebury. 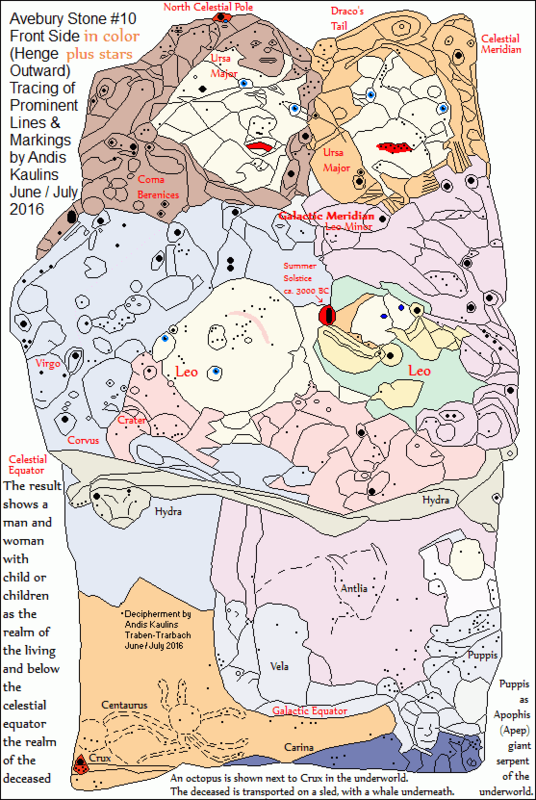 As we can surmise from our decipherment of Avebury Henge in particular and Avebury Stone #10 specifically (and of course, also from decipherments of the other Avebury stones as well), the origin of the ancient cosmological viz. religious belief system of Ancient Britain was astronomical in foundation. The "gods" of Ancient Britain were "in "heaven, which we allege are still found today in names such as "Ave" and "Avon" ["Heaven"]. "Avebury" was indeed surely in part an "Ave-Bury", a "heaven's-oriented burial ground". As we know from our Stonehenge decipherment, whose publication is also being prepared at this same time, the ancients placed the origins of their souls in the heavens, indeed, at the galactic center of their Milky Way galaxy. The "realm of the living" at Avebury was represented by the Avebury Henge earthwork, which represented the Milky Way, with its megaliths as the stars of the Milky Way and the stars within the elliptical enclosure of the Milky Way. The stars beyond the Milky Way represented the ocean of the underworld. The far depths of stars at Puppis (Apophis) were viewed as the deep "realm of the deceased", similar to the ancient Egyptian mythological demon Apep (Apophis), https://en.wikipedia.org/wiki/Apep, representing the giant serpent of the deep that was regarded to consume the mortal remains of the dead. "The site was largely destroyed in 1723 although not before William Stukeley was able to visit and draw it. Stukeley considered the stones at The Sanctuary to represent the head of a giant pagan serpent marked out by the Kennet and Beckhampton Avenues." At Avebury, the avenue known as Kennet Avenue or West Kennet Avenue -- https://en.wikipedia.org/wiki/Kennet_Avenue -- leads from the realm of the living – Avebury Henge – to the proverbial giant serpent that figuratively consumed the deceased at The Sanctuary. This was surely the path taken by ancient funeral processions in that era from Avebury Henge to The Sanctuary. Stones as human figures to the side of Kennet Avenue are arguably memorials. The word "kennen" in German means "to know someone", which suggests that these figures of Kennet Avenue were "people once known". Perhaps these were the royal couples. Henge-Outward Face of Avebury Megalith #10 -- see "the break" ? Avebury Stone #10 shows that the realm of the living and realm of the deceased were also set apart by the basic lines formed by important astronomical parameters, which in turn then also defined how the ancients viewed the stars in their imagined asterisms. The "center" of the realm of the living was represented by the circumpolar stars at midheaven, around which all the stars seemed to revolve. On Avebury Stone #10, Boötes is represented as the creative phallic force of heaven. Ursa Major marks the heads of humanity as the living beings depicted in stone, with their heads above the Galactic Meridian, showing the eternal life of the soul. Leo marked their human progeny. Ursa Major was arguably seen as the "cup of life" of the living. Hydra was drawn as a surface-based serpent that marked the Celestial Equator. That Celestial Equator is not fixed, but varies due to axial precession. In ca. 3000 B.C., Hydra marked the Celestial Equator almost exactly from head to tail. The horizontal stone "break" viz. overlapping stone "projection" on Avebury Stone #10 is found in the middle of the front (henge-outward) face of the stone and thus clearly marks Hydra, which is drawn on Avebury Stone #10 with its head pointing to the left, rather than to the right, as is modernly done. It was this strange break in the stone that led us to decipher Avebury Stone #10 before the other stones because we were intrigued to discover why the ancients would do that, which we did not know at that time. Below Hydra are two large figures and several smaller ones. To the left, a large leg and foot marking the "base" of the galaxy, the known universe, as it were, with the heel of the foot set firmly on the Galactic Equator at Crux, the Southern Cross, at the thinnest part of the Milky Way ellipse. The other large figure to the right is the head of a whale, Physeter macrocephalus, today known as "the sperm whale", marking the watery realm of the underworld. Alpha 1 Crucis ("ACrux") is the brightest star in Crux and the 13th brightest star in the heavens. 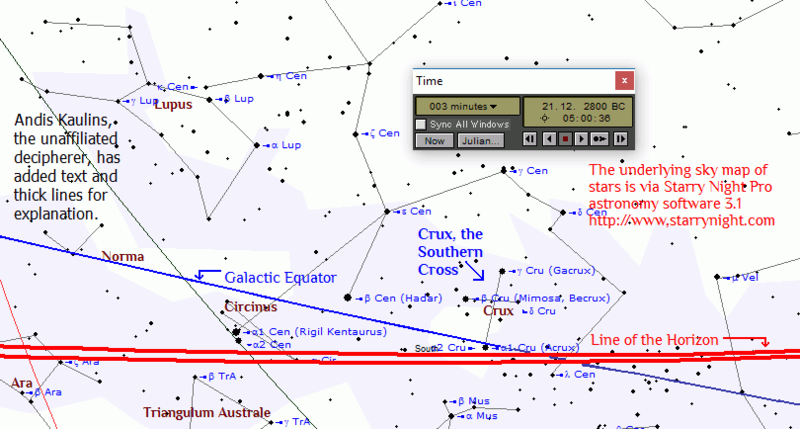 It is the "bottom" star of the Southern Cross and sits virtually on the Galactic Equator, which -- as shown by our analysis -- the ancients regarded as one of their fundamental astronomical bases. ACrux was still completely visible at Avebury ca. 2800 B.C. but soon thereafter started to drop into invisibility because of axial precession. The Division I Learfield Directors’ Cup Fall Standings have been released. "Reigning champion Stanford maintains the top spot of the final fall Division I Learfield Directors’ Cup standings". followed by UCLA and North Carolina. Stanford also extended to 41 years the Cardinal's streak of at least one national championship per year by winning the 2016 men's soccer and women's volleyball titles. Stanford has won more team and individual titles than any other college. Talk about a culture of excellence! Stanford's athletic record over the years is all the more astounding given the fact that its major competitors have much larger enrollments. Last year Ohio State finished 2nd in the Learfield competition and ranked first in the nation in student enrollment at 63,016, of which 49,435 were undergraduates. By comparison, Stanford had 6,999 undergraduates (14% of the Buckeye total !). Surely the outstanding Cardinal athletic record is in part attributable to the independence of Stanford's athletic financing. But you also must have great admission "recruitment". Of the 6999 Stanford undergraduates, about 900 were student-athletes, a very high percentage. The much larger overall enrollment at large state universities is however not matched by a corresponding percentage of such students-athletes, already because NCAA regulations place limits on the financial aid and scholarships that can be offered. Ohio State, for example, has somewhat over 1000 student-athletes. In other words, in terms of the number of enrolled student-athletes, Stanford probably matches many much larger universities. We regularly post about Stanford University athletics because of the sometimes controversial rankings of U.S. colleges and universities published by mainstream media, which generally do not factor athletic programs or things like Silicon Valley into their equations. When those are added, it is difficult to beat Stanford. In fact, the many college applicants wishing to study at Stanford University have made Stanford The Toughest U.S. College to Get Into -- and that for good reason. Mens sana in corpore sano -- Latin for "a sound mind in a sound body". We must add, as a Stanford Law School graduate, that we are of course heavily biased, but we chose Stanford over many other superb law schools. Stanford University is simply unique. Western democracy can be viewed as a luxury institution that is dependent on a world in which resources, goods and services are available in abundance to those who support a democratic kind of government system. Democracies have difficulty in environments where scarcities of resources, goods and services prevail. Societal inequalities tend to go hand-in-hand with the emergence of scarcities, which generally leads to political changes. At fault are the elites of a democratic society who have permitted the scarcities to emerge -- and so they are viewed by those who are suffering the scarcities, quite apart from any perceived loyalties to "democracy". Defining a system as "democratic" is no guarantee of democratic or political success. Indeed, modern democracy is multi-faceted and has all kinds of freedoms, none of which are guaranteed in a complex, ever-changing world. When people speak of democracy, it is often the case that all three are intended, but they need not be. A person can live in a politically undemocratic system but still have a large degree of economic freedom, if their wealth and social position permit it. Conversely, a person can live in a politically democratic system but can have little economic freedom if goods and services are not available, or if a person does not have the means to buy the goods and services that are available. A related phenomenon is that personal freedom in the form of freedom of movement can exist even if political and economic freedom are limited. For example, the ability of persons to move about freely is one of the underestimated freedoms of modern life, dependent, for example, on having access to public lands, public property and public services. Public roads and highways are a good example. Without them, life would be "unfree". People are able to go beyond their own front door ... that is a great freedom, which is really neither political nor economic. But also that can be limited. Another significant aspect of personal freedom is the greatly underestimated freedom to choose how we spend our time, which is a main component of life. How people choose to spend their time greatly impacts the nature of the human world that we live in, far more than any other factor. Thankfully, mankind is consistent in its behavior, otherwise, economies would be in chaos. Personal freedom of association is a related freedom, i.e. the ability to pick and choose who we spend our time with, how and where. No system has discovered a perfect solution for this particular freedom, which is limited by factors too complex to discuss here. Needless to say, our freedom of association is limited by the various social rules that mark all societies. Freedom of speech is a further popular freedom, which is sometimes overinflated in modern legal theory. Many speak, but who listens? That in part explains the Trump phenomenon. When the man on the street finds that his freedom of speech is essentially without effect, he seeks a champion who is viewed as able to give that voice the power to be heard. That is the necessary extension to the freedom of speech. Those who view Trump solely as Trump the person are in error. To understand Trump, you have to see the voters whose champion he is. He is THEIR voice. In any case, democracy and freedom are more complicated than they look. We are dependent on good graphics software for certain aspects of our online presence so that we are interested in new program developments in this field. The open source desktop graphics software program Krita for Microsoft Windows -- an eyeopener as a free digital painting program targeted for artistic use -- came out in a new version in December of 2016 and is available under the GNU General Public License. It can be downloaded at krita.org/en/. Once downloaded, the English-language user interface can be changed to any of the numerous other languages in the main menu under Settings / Switch Application Languages. The Krita menus can be customized via the main menu at Settings / Configure Toolbars. For example, we added a "back" icon to the menu, which we use when drawing. The standard graphic interface may be too dark for some users and can be changed at the main menu under Settings / Themes. The available themes are Breeze Dark, Breeze High Contrast, Breeze Light, Krita Blender, Krita Bright, Krita Dark (the default theme) and Krita Neutral. We prefer dark print on a lighter background so we chose Krita Bright, but it is a personal decision. The "canvas" background can be changed at Settings / Configure Krita / General / Window / Window Background. We changed from black to the hex color code #ababab. That is the practical background color for Paint Shop Pro 7 which we have used for years. There is also a separate color setting for the canvas border at Settings / Configure Krita / Display / Canvas Border. A program for picking any colors from the screen that one may want to use in a program like Krita is something like the color picker Instant Eyedropper. Caveat Emptor: Our above review of Krita is made solely for providing information about Krita and is not a recommendation, nor do we make any guarantees about the program, with which we are not affiliated in any way. Lawyering, IP, Net Neutrality, Innovation and the Law are featured at the current Stanford Lawyer Magazine, Issue 95, Fall, 2016, which we receive quarterly as a Stanford Law School alumnus, and which is found online at https://law.stanford.edu/stanford-lawyer-magazine/. "While network neutrality is about the architecture of innovation, intellectual property rules like patent law, trademark, and copyright are about the innovations themselves." "The Supreme Court’s decision in Alice ... was useful in analyzing the question of patentable subject matter and setting out a framework for how to assess whether or not a patent has made a unique and non-obvious contribution to the art." "Our general findings so far indicate that litigation growth in the past 15 years is due largely to the rise of PAE-initiated lawsuits. These lawsuits tend to involve software patents and they resolve much more quickly than other lawsuits, lending credence to the theory that PAEs often assert with the goal of extracting quick money from defendants. "[Paul Goldstein, the Stella W. and Ira S. Lillick Professor of Law at Stanford Law School ("SLS"] "has overseen a partnership between SLS and the United States Copyright Office to protect copyright owners while allowing the flow of information to remain relatively unfettered". [The result has been creation of] "a prototype for licensing photographs". This is obviously an interesting issue for intellectual property questions but there are also addtional Stanford Lawyer articles on privacy, veterans treatment, criminal investigations, virtual law practice, class action litigation, public research and leadership in education, and peer review in government.